This is the second of three Division 10 starter sets. 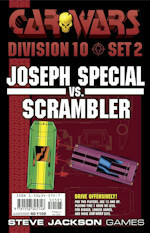 Each one gives you rules, full-color 2-sided counters, a turning key, and two evenly matched car designs. Get one and play; get all three and set up a free-for-all! Slow but tough, the Joseph Special mounts both an anti-tank gun and a rocket launcher, with a minedropper to the rear. 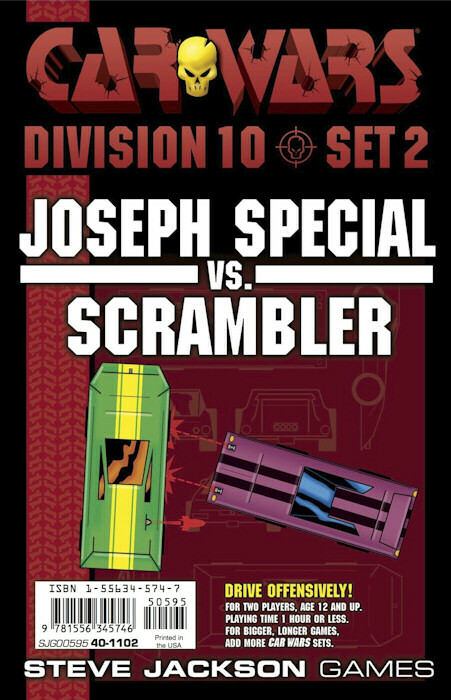 The nimble Scrambler has twin machine guns and a micro-missile launcher, plus an oil jet to deter pursuit. Each has a gunner as well as a driver.